If you don’t know already, the month of April is Autism Awareness Month here in the United States. 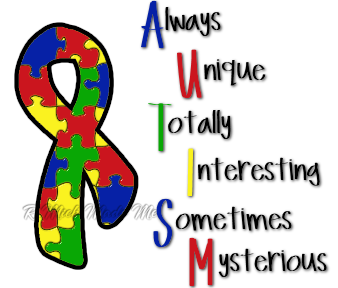 And seeing how the month is almost over, I thought I’d dedicated this post to those individuals with Autism, my brother, specifically. My brother was three years old when he was diagnosed, and my family’s life hasn’t been the same since. I can’t tell you how many countless hours my brother has spent with therapists working on his speech and cognitive ability and how many days he was in the Special Education room at our high school only for us to realize that he isn’t so different after all. He’s still a typical boy who has his own likes and dislikes, he just can’t express himself in the same way we can. For years, my family has gotten stares and weird looks in public places when my brother has cried out, hummed, or even danced near complete strangers. Even tonight, we went to our local YMCA for a swim and a young boy (probably only about 10 or 12) told my brother to hand over the ball he was holding because he was supposed to use it to shoot hoops not hold it! Of course, I glared at the boy and flipped him the bird…in my mind. But, we carried on, business as usual. When I was younger, I would get so embarrassed half the time because my brother would have to use the ladies room with my mom if my dad wasn’t around so that someone could help him in the bathroom. We even stopped going to church because my brother loves to laugh, hum, and cry out during inappropriate times. Whenever someone looks at him, all they can see is his age, so they’re completely confused as to why he’s behaving “in that way.” Nowadays, I don’t give as many shits. If he cries out, he cries out. If he decides to dance in the middle of the grocery isle, let him have at it (as long as he’s not in anyone’s way)! I’m not saying that I’m completely fine with his outbursts and that they never embarrass me. Of course, I still get agitated with him every once in awhile. But he’s my brother, and that’s what siblings do. If anything, he’s made me more of a tolerant person. Yes, people mess up once, twice, three times even! But, because I live with a boy who constantly needs to be reminded to wash his hands after he uses the bathroom, or to take his shoes off before climbing into bed, I’ve never gotten into a heated/screaming match with anyone. No one has ever pissed me off that much…because, it takes A LOT for me to REALLY show my frustration. Like my dad says, “everyone should have at least one disabled child so that they know what it’s really like.” And, I completely agree. There’s too many government officials trying to cut funding for those with disabilities and it brings me to near tears when I think about how much those with disabilities have already been shafted in life, how many limitations they have when it comes to things to do, places to go, or people who will take care of them, and now this? My father actually has a friend who works for the government and has a disabled daughter, and because of that, he makes sure that he knows every law and is able to fight that much harder for her rights. He’s actually helped a lot of families (mine included) knowledgeably advocate for their disabled child. And, never would he have become so involved if he didn’t have a daughter with a disability. My brother and other individuals with disabilities that I have spent time with over the course of my life thus far have helped me get a better perspective on what really matters in life. Not only that, but they’ve also taught me how it’s important to treat individuals with the utmost respect, say what you feel, and do what makes you happy. If you’ve never had the chance to spend time with an individual or individuals with a disability, I encourage you to volunteer for the Special Olympics, or for a disabled group home. Even if it’s just for an hour and only one time! Make some sort of interaction with these uniquely talented and special individuals, and I guarantee your life will change for the better.